Filtering Audio data with user defined FIR Filters is the main purpose of the AudioFilter program. The downloadable program package includes various different FIR Filter input files which can be used directly. Just press the Select Filter button and select the filter of your choice, e.g. a Lowpass filter. All filters included in this package were designed using the WinFIRFilterDesigner program. AudioFilter however can import any ASCII based FIR Filter definitions from third party programs and is not restricted to be used together with the above mentioned program. A new ring-buffer approach for FIR filtering is used, which decreases the memory consumption during filtering dramatically and speeds up the filtering. As a general rule, you can filter any file as long as it fits into physical memory. The Mixer functionality was introduced, which enables much more possibilities. For example, if you need to enhance the high frequencies of a sound file, you can mix the original sound with the highpass filtered sound to get the desired outcome. The mixing range for the original and the filtered sound is user definable. Median filter for noise reduction and effects. Fixed a bug with the progress bar for very long files. MP3 decoding using built-in decoder. MP3 encoding using BladeEnc dynamic link library. MP3 has become the most popular format for music on the net. If MP3 files shall be filtered with the AudioFilter, the MP3 data stream has to be converted to a WAV file in advance. This can be done either by using the built-in decoder of AudioFilter, or by using one of the many available external tools that can be found on the net. One of the most convenient ways of converting MP3 to WAV is to use WinAmp. (1) Press Ctrl+P when WinAmp is active. (2) Select 'Plug-ins Output' and double-click 'Nullsoft Disk Writer plug-in'. (3) Select a directory for WAV file output (e.g. C:\Temp). (4) Click on 'OK' and in the Preferences windows on 'Close'. (5) When you next play an MP3, it will be streamed to the selected directory. (6) Select 'Nullsoft Direct Sound plug-in' to switch back to normal sound output. 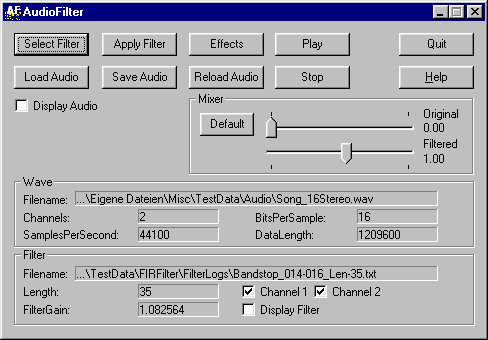 The most common application of the AudioFilter program is to filter music tracks, either from music CDs, longplayers or audio cassettes. Rip the tracks from a music CD and store them as WAV files which can be further processed by AudioFilter. Programs that can do this job are found on many different sites in the web. Once you are done, use a freely available MP3 encoder to convert WAV files to MP3. Assume you want to filter a track from one of your Audio CDs. You have to rip the track somehow from the Audio CD and store it as a WAV file on your harddisk for further processing with AudioFilter. Programs doing that job are usually called CDDA ripper. (1) Insert the Audio CD in the PCs CD-ROM drive. (2) Start CDCOPY and select the track that you want to extract. (3) Select 'Functions' and 'Write' from the programs menu to start the ripping. (4) The WAV file can be found in the CDCOPY program directory by default. Starting from AudioFilter V2.0, you can save your WAV files directly to MP3. The only thing you need is the Lame dynamic link library which can be downloaded from the Lame Encoder homepage. Download lame_enc.dll to the AudioFilter program directory and rename it to BladeEnc.dll. (1) Load a WAV file via 'Load Audio'. (2) Optionally apply FIR Filters to the sound. (3) Click on 'Save Audio' and as FileType select 'MP3'. (4) Modify the default options to your needs.